Georgia’s Open Meetings Law places only a small burden on county governments to notify their citizens when official governmental bodies meet, but that minimal burden has been cited on two recent occasions by the Oconee County Board of Commissioners to justify holding meetings that exclude citizens. 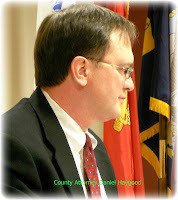 At the Feb. 3 regular BOC meeting, County Attorney Daniel Haygood advised the Board that if it were to follow through on a suggestion by newly elected Commissioner John Daniell to create committees of the BOC to develop the 2010 fiscal budget, those committees would have to give public notice before meeting. The Board decided not to appoint the committees. Melvin Davis, chairman of the BOC, left a Dec. 17 meeting his staff had called to discuss the county courthouse because he had not given proper notice of the meeting, and his presence would have made it illegal since a quorum of the BOC was present. The meeting had been called more than a month in advance, so David had plenty of opportunity to give proper notice had he wanted to. All that Davis was required to do, and all the committees the BOC considered but did not appoint would have been required to do, was tell citizens when and where the meetings were to be held. The law requires that citizens be given "due notice." That means that Davis would have had to have posted a notice at the courthouse about the meeting and informed The Oconee Enterprise and the Athens Banner-Herald about the meeting at least 24 hours before it took place. The county has to inform the Enterprise because it is the legal organ of the county, that is, the publication that carries legal advertisements. The county has to inform the Banner-Herald of the meetings because it has officially requested that it be notified. A committee of the commissioners would have to do the same. In an emergency, it could meet with less than 24 hours notice, provided it notified the two newspapers. The only other requirement is that there must be at least some type of agenda for the meetings. Wayne Provost, director of Strategic and Long-Range Planning for the county, sent out an agenda for the Dec. 17 meeting about the courthouse as an attachment to a memorandum dated Nov. 19. The Banner-Herald placed that memorandum on its web site when it learned of the Dec. 17 meeting and wrote about it on Feb. 6. The memo from Provost was addressed to Superior Court Judge Lawton Stephens, Clerk of Superior Court Angie Watson, Tax Commissioner Harriette Browning, Sheriff Scott Berry, District Attorney Ken Mauldin, Probate Court Judge David Anglin, Watkinsville Mayor Jim Luken, Public Works Director Emil Beshara, and Davis. The memo also was copied to the other four members of the Board of Commissioners. According to minutes of the secret meeting prepared by Provost and on the Banner-Herald web site, Davis left the meeting after two other commissioners showed up. Those commissioners were Chuck Horton and Don Norris. The presence of Davis, Horton and Norris meant that a quorum of the five-person commission was present. Under that circumstance, public notice was required, and none had been given. Why Norris, whose term expired 14 days later, didn’t go home so that Davis could join Horton, both of whom started a new four-year term on Jan. 1, is an interesting question that neither the Banner-Herald nor the Enterprise explored. It was this requirement of public notice that created the problem for several on the Board when Daniell suggested on Feb. 3 that the Board create committees to help develop the budget. Davis said that he had seen a copy of Daniell’s proposal before the meeting and had discussed it with County Attorney Haygood. Daniell proposed that the Board create six budget committees. These committees would work with the finance department to review and shape the budgets for the county departments and for the other governmental officers, such as the sheriff and tax commissioner. Daniell wanted each committee to be made up of no more than two commissioners, which is less than a quorum of the Board. When prompted by Davis, Haygood said the open meetings law applied to the committees regardless of how many commissioners were present. A quorum would be a quorum of the committee, not of the full Board. "If you appoint committees of the Board, they are going to have to comply with the open meetings law," Haygood said. "There is nothing wrong with that of course. But it is going to make it a little more cumbersome. But you’ve got to post notices and take minutes and that kind of thing." "I don’t care who comes," Commissioner Jim Luke said. "I don’t want to have to schedule a week ahead and post and go through the process." "It is not really a committee if it is just commissioners sitting in," Commissioner Margaret Hale asserted. "In my mind, it was a committee," Daniell said. "That was my intention. If you have to post notice, I’ve not got a problem with that either way." A meeting cannot be open to the public if members of the public are not informed about it before it takes place. To avoid the requirement that the meeting be open to the public, the Board rejected Daniell’s proposal and decided instead that no more than two commissioners, including Davis, would attend the budget meetings. At the end of the Feb. 3 meeting, when citizens were given a chance to address the Board, Kate McDaniel, a frequent meeting attender who manages the web site A Positive Vision for Oconee County, asked if these budget meetings would open to the public. Davis told her emphatically that they were not public meetings. That raises the question, of course, as to whether the meeting is not public because no notice is required by law or whether the lack of a required notice is being used to keep the public from attending. In the case of the Dec. 17 meeting on the courthouse, it is quite clear that Davis was doing what the law allowed to keep the public in the dark. A Banner-Herald editorial on Feb. 8 criticized Davis for holding a secret meeting, arguing that the public should be involved in discussions about the courthouse. For some reason, the editorial also praised Davis for leaving the Dec. 17 meeting so as not to break the law. Haygood’s argument about the applicability of the state law to committees appointed by the Board of Commissioners also was interesting in light of arguments he had made less than a year earlier. On Nov. 17, 2007, the Board, as part of its request for proposals for engineering work on the then proposed and now postponed Rocky Branch sewage treatment plant, created a selection committee to review the bids. Such a committee, as Haygood told the BOC on Feb. 3, should be covered by the state’s Open Meetings Law. When I asked in February of 2008 to be informed of the time and place of the meeting of the selection committee so I could attend, however, I was told by Haygood it was not a public meeting. I filed a complaint with the state attorney general on Jan. 17, 2008, claiming I had been wrongly excluded from what should have been a public meeting. In response to my complaint, Haygood told the attorney general that the committee that met was not the one specified in the request for proposals and that the committee wasn’t covered by the state’s Open Meetings Law because it was dealing with sealed bids. Committees dealing with sealed bids, however, are not a listed exemption to the Open Meetings Law. The committee that met in secret to review the bids also was the only one appointed by the county for that purpose. On Feb. 29, 2008, Senior Assistant Attorney General Stefan Ritter wrote me and rejected my complaint, saying that the "meetings of the Selection Committee are not meetings as defined by the Act or at least I have insufficient evidence to believe that they are open meetings." In April of 2008, Attorney General Thurbert Baker and Senior Assistant Attorney General Ritter joined Executive Director Hollie Manheimer of the Georgia First Amendment Foundation and others in producing the Fourth Edition of "A Citizen’s Guide to Open Government." On page 6 of the booklet, the authors discuss what meetings in Georgia are open to the public. The booklet listed as examples of open meetings those of a number of bodies, such as county commissions, regional development authorities, library boards, school boards, commissions or authorities established by state or local governments, planning commissions and zoning boards. "In short," according to the booklet, "the Law applies to nearly every group that performs any function of a government entity. Very few governmental bodies are exempt from coverage." Someone even could argue that the meeting Wayne Provost called on behalf of Chairman Melvin Davis involving most of the elected officials of the county to talk about what needs to be done to make the courthouse safe and efficient for conducting county business is covered at least by the spirit of such a law. But making that meeting open would have required the giving of public notice some time between when Provost wrote his memo on Nov. 19 and 24 hours before the meeting got underway at 9:30 a.m. in that courthouse on Dec. 17. And that was too burdensome.